Wine labels provide useful information to assist in the selection and appreciation of wine. Different countries have different standards for what information is required on a wine label. In the United States, wine labels are regulated by the Alcohol and Tobacco Tax and Trade Bureau of the U.S. Treasury Department (often referred to as the TTB). Some states such as California have adopted supplemental labeling laws. Napa Valley wineries have historically provided more information than the minimum amount required by law. 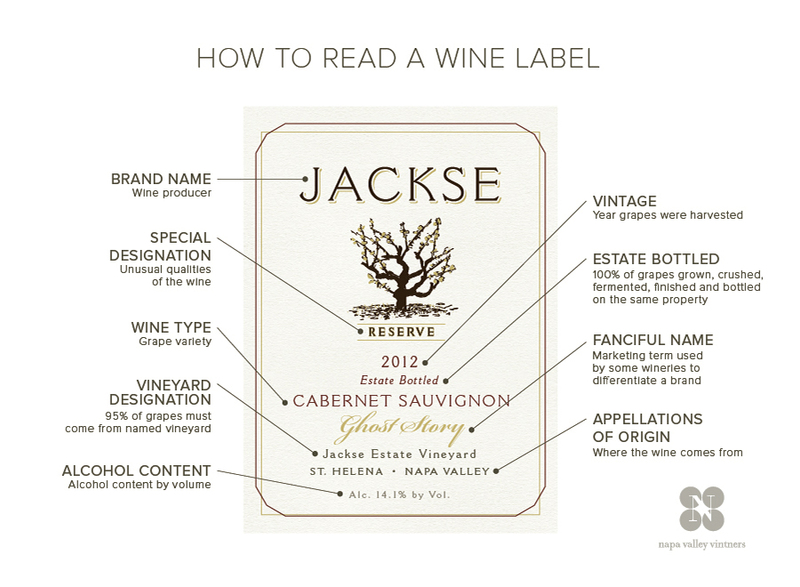 This infographic and guide will help you understand a wine label like a pro, so you can buy with confidence. Mandatory. If no brand name is on the label, the bottler's name is considered the brand. It is also useful to refer to the bottler's name if a winery has several brands. Mandatory. A wine may be labeled by a grape or varietal name such as Chardonnay or Cabernet Sauvignon, or it may be given a generic name such as “Red Table Wine.” Wines using varietal names must derive at least 75% of their volume from the grape designated, and the varietal name must appear on the label with an appellation of origin. Although not required, many wineries voluntarily list the proportions of the grape varieties that comprise their wine blends. Appellations of origin that are the names of states and counties can be used on wine labels under federal law if at least 75% of the grapes come from the named state or county. The remainder of the grapes may come from outside the named state or county. For wine labeled with an American viticultural area (“AVA”), which is a specific type of appellation of origin established under federal law, at least 85% of the grapes must come from the named AVA (for example “Napa Valley”), while the remainder of the grapes may come from outside of the AVA. That wine must be fully finished in the state in which the AVA is located. California law requires that 100% of the grapes come from within California for any wine labeled with the appellation of origin California or a geographical subdivision of the state. This is stricter than the federal labeling standard. Optional. The vintage designates the year in which the grapes were harvested. As of May 2006, federal regulations allow that up to 15% of the blend can be from a vintage other than the stated year. The law was designed to allow American producers to be held to the same standards as other wine producing countries. Previously, the U.S. standard required that 95% of the grapes in the bottle be from the stated vintage. This regulation only applies to wines that do not use an AVA. For example, if the grape source is noted to be “California,” 85% from the stated vintage is the applicable rule. AVA wines are held to a higher standard. For example, for wines labeled Napa Valley or one of its sub-appellations, 95% of the grapes must be from the stated vintage. The vintage bears no relationship to when the wine was bottled. Optional. Marketing term used by some wineries to differentiate a brand. Optional. Labels often contain special terms to indicate unusual qualities of the wine, such as degree of sweetness or color. Sometimes the wine is of such a high standard as to be designated by the winemaker as a special selection or private reserve. Optional. Many wineries name the vineyard where the grapes were grown because the winery believes the property produces an unusually high-quality grape. The winery or an independent grower may own the vineyard. When using a vineyard designation on a wine label, federal regulations require that 95% of the grapes be grown in the named vineyard. “Produced and bottled by” certifies that the bottler fermented 75% or more of the wine at the stated address (for example, “Produced and Bottled by ABC Winery, St. Helena, California”). In combination with other information on the label, such as a vineyard designation, this term provides the consumer with significant information about the origin of the wine and who is responsible for its production. “Cellared and bottled by” indicates that the bottler has subjected the wine to cellar treatment before bottling at the stated address. “Made and bottled by” indicates that the bottler fermented at least 75% of the wine at the stated address. “Bottled by” indicates that the winery bottled the wine at the stated address, which may have been grown, crushed, fermented, finished, and aged by someone else at some other address. Optional. This term certifies legally that the winery grew 100% of the grapes on land it owns or controls and that the winery crushed, fermented, finished, aged, and bottled the wine in a continuous process on the same property. Both the vineyard and winery must be located in the viticultural area that is stated on the label. Mandatory. This statement on a wine label indicates the alcohol content by volume, with a tolerance of plus or minus 1.5% if the wine has an alcohol content of 14% or less and a tolerance of plus or minus 1.0% if the wine has an alcohol content of more than 14%. However, the tolerance cannot be used to cross the 14% alcohol content threshold, which is the dividing line between two tax classes. So a wine that is actually 13.5% alcohol by volume could be labeled 12% or 14% but not above 14%. Finally, a wine that is 14% or less alcohol by volume can be labeled “table wine” without any notation of the numeric alcohol content. Mandatory. The fluid volume in metric measurement must be indicated on the label or be blown into the glass. Mandatory. Wines which have a level of 10 parts per million or greater of sulfur dioxide must be labeled with a sulfite declaration (“Contains Sulfites”). Mandatory. All wine bottled after November 18, 1989 must bear the health warning statement in the exact manner and wording specified in the federal regulations.